The Clantons have been fixtures on the dirt track scene for decades. Shane’s father, the late Billy Clanton, was one of the toughest drivers back when one had to be tough to race in a rough-and-tumble sport. He was an outlaw by racing standards, of course nothing like the real outlaw Billy Clanton, who was gunned down at the OK Corral. In the racer Billy Clanton’s day, drivers built cars from parts found in junkyards or fabricated in backyard shops. Even his biggest enemies in the sport readily acknowledged that when it came to building beautiful race cars with relatively crude tools like cutting torches and stick welders, Clanton had no equal. Roscoe Smith, who often worked side-by-side with Clanton building race cars for others, remembers how Clanton could take his torch and remove the sheetmetal skin of a passenger car almost as fast as he could walk around the car. Clanton also was skilled behind the wheel, and despite his fierce independent streak, managed to win his share of races, including one of the National Dirt Racing Association events at Rome Speedway in the days when the NDRA attracted the best drivers in the country. Clanton’s three sons all followed in his tire tracks, with Rusty and Joey racing predominately on asphalt. Joey went on to win an ASA championship and eventually advanced all the way to NASCAR’s Camping World and Nationwide Series. Billy’s daughter Sonya married a dirt racer, Rodney Dickson, and now their daughter Kami is winning races on the local go-kart circuit. Shane never showed interest in pavement racing, and for years has made a living driving dirt cars. 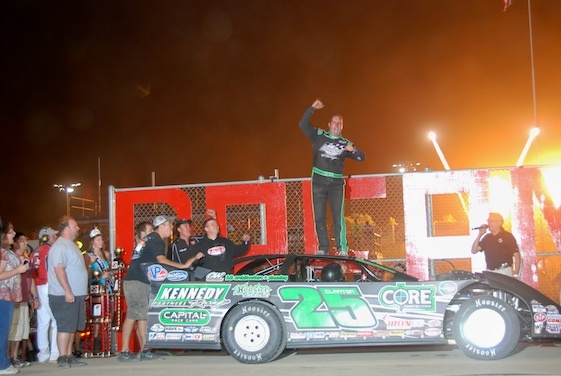 His Dream win was one that would have made his father proud for several reasons, among them that he drove a Capital City race car that he helped design and build. He and fellow racer Marshall Green began building the cars last year. And Billy surely would have been happy that Clint Smith, the son of his old friend and fellow car builder Roscoe Smith, was a contender at the Dream, running as high as third before fading to sixth at the finish having used up his tires trying to catch Clanton. It also would be pleasing to the father of the Clanton clan that Shane has built a racing resume that cements the family name in the history of dirt racing. Clanton’s now one of just five drivers who have won both the Dream and the World 100 at Eldora, and he has 15 World of Outlaws feature wins to date and surely more to come, all in addition to the features he’s won elsewhere over the years. Clanton said this week that the significance of his Dream win really hasn’t sunk in yet. “Right now it’s just another trophy in the case,” he said. He did acknowledge that one day there will come a time to look back and know that he was able to win many of dirt racing’s showcase events. But his time to reflect was short. By midweek he was on the road to Hagerstown, Md., then on Pennsylvania and Canada and the upper Midwest, following the World of Outlaws Series. It might seem like an odd lifestyle for some, but for Shane Clanton it should be familiar. Many a night back in the day, Billy Clanton would arrive at the track with his family riding in a four-door ramp truck with his familiar No. 25 on the back. And many of those nights, the winner’s trophy and pay left the track in the Clanton truck. Times have changed and racing has changed, but Shane Clanton has done a fine job of carrying on his family’s tradition. When I saw that Shane had taken home the money at Tony Stewart’s place, I was anticipating hearing the rest of the story. Thanks Rick!